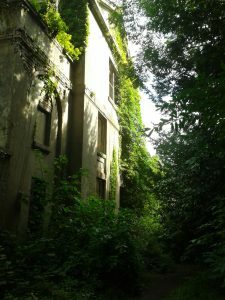 Baron Hill, situated just outside Beaumaris on the Isle of Anglesey, North Wales, was once the mansion house for the Bulkeley family, but is now a ruin; the deserted, empty shell of the once beautiful house is now covered by foliage, nature having taken over the Bulkeley family seat. The site is eerily silent, with only the rustle of the breeze against the leaves and the occasional bird song breaking the dead quiet. The golden sunlight filters through the trees to reveal the remnants of the once glorious building, and a year after I first visited the site, I returned to take some more photos of the abandoned house. The view from the rear of the Baron Hill. 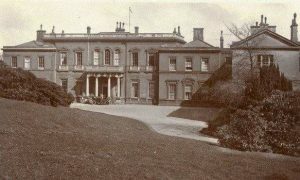 Edward VII visited Baron Hill, here he can be seen sitting on the terrace taking tea with members of the Bulkeley family. The same spot as the previous photo was taken today. 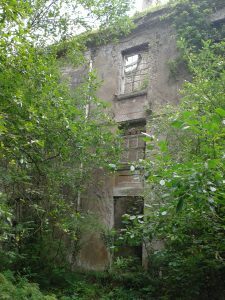 A doorway to nowhere remains. Through the trees the columns can just be seen of the once grand portico. Part of Baron Hill today. This section can be seen in the old photo to the bottom right. This is a photo c.1900 of how Baron Hill once looked in its glory days.